Ben, Jana and Shane Morash are among Powell River’s young residents who have been to Children’s Hospital in Vancouver, the provincial health centre for patients up to 16 years of age. 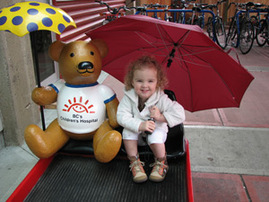 Three young children belonging to Gail and John Morash all have visited BC Children’s Hospital in Vancouver. Twins Ben and Shane were among 466 visits from Powell River youngsters in 2006. Big sister Jana also visited Children’s Hospital shortly after the four-year-old and her parents moved to Powell River late in 2005. “We were so thankful to have these services available to our family,” added Gail. 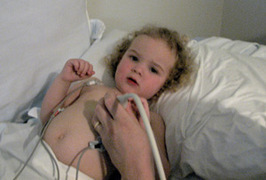 Since 1985, Powell River has donated more than $224,000 to Children’s Hospital. Funds raised in 2006 were used to purchase a Sani Sport, a piece of equipment that costs $15,960. Therapy Equipment and small tools are frequently used to provide custom equipment for children with infections in isolation. Cleaning and sanitization of equipment is difficult in the area where we provide services. This new mobile unit can be taken to the child's room or assessment area and therapy equipment can be cleaned on he spot with no need to transport contaminated equipment throughout the centre. The Morashes donate to the United Way through payroll deduction at John’s workplace. For information on how to have a payroll deduction presentation at your place of work, call the United Way Office at 604-485-2132. It only takes 10-15 minutes.